Day 22 marks two-thirds of the way through the Crumpet’s Nail Tarts 33 Day Challenge. I’ve surprised myself that I’ve managed to do all the challenges, and do them on time. 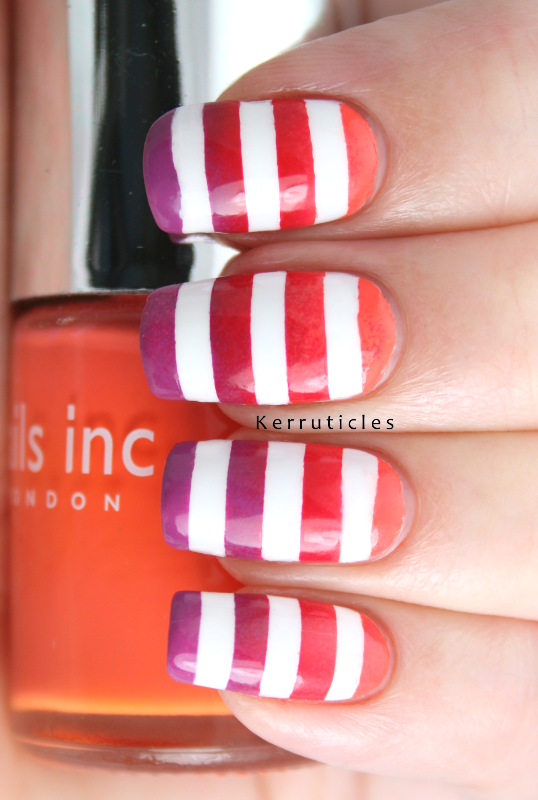 For today’s theme, I always knew I wanted to do a gradient with a white pattern using striping tape. I’ve seen lots of people do this sort of thing with a zig-zag or a chevron pattern. I thought I’d be a bit different and I set out to do a curved line using French nail guide stickers. But by the time I’d placed the guides on a couple of nails, I could see quite clearly that the curve of the sticker wasn’t all that evident. So I decided to use straight lines instead. I asked my husband what colours I should choose and he said orange, red and pink. I picked out a Nails Inc. orange (Porchester Place) and a Nails Inc. red (St James), so then decided I should use all Nails Inc. polishes. But I didn’t have a pink except for a very pale one, so chose one of my very favourite colours, Devonshire Row. It’s a wonderful bright purple, which Nails Inc. describe as a rich lilac. But for me, lilac is so much lighter than this shade is. 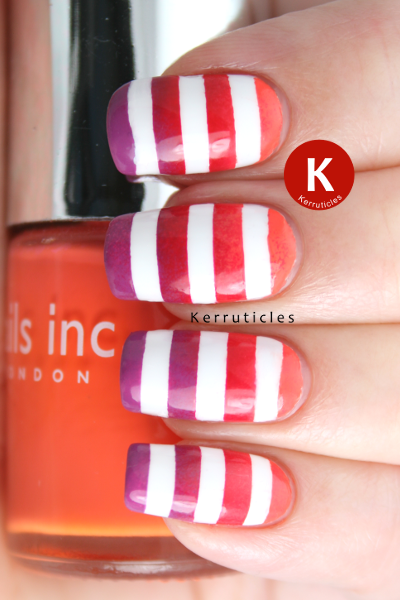 I love this manicure – despite a few wobbly bits on some of the lines – and am really pleased with how it’s turned out. I don’t want to take it off, but it will only get two days’ wear as I have to do Wednesday’s challenge manicure soon, which is geometric.